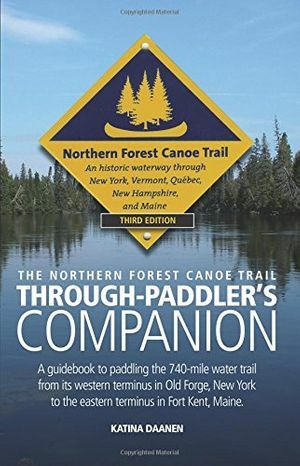 A companion guidebook for paddlers who intend to canoe or kayak the 740-mile Northern Forest Canoe Trail in a single trip from Old Forge, New York to Fort Kent, Maine. Written by Katina Daanen who through paddled the entire Trail in her canoe in 2011. The Through-Paddler's Companion documents navigating the Trail in its entirety-west to east-from the perspective and unique needs of an expedition paddler or anyone looking for more detailed information while following the official NFCT maps. It provides comprehensive and tactical advice about specific water bodies, including upstream paddling directions, portage (or carry) descriptions and distances, and mileage markers, while offering suggestions for ordinary, yet sometimes elusive matters, such as where one might spend the night. Paperback, 5.5" x 8.5", 245 pages, 3rd edition 2017. Members receive a 15% discount. Current members will need to Register once to enable their discount.